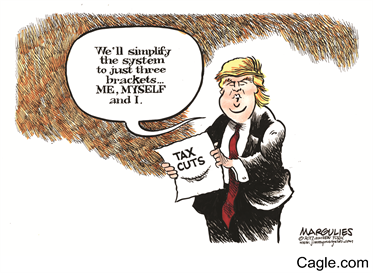 Wackydoodle sez: He's goin' to build debtor prisons too! Trump's radical tax cut plan for the rich is going nowhere fast in the Senate despite the passage of a budget resolution by that body on Thursday. The Repugnant majority is razor thin and there are already rumblings of non-support in the caucus. Still, the passage of a budget will allow them to vote on a tax bill with a simple majority under the budget reconciliation process, clearing a major procedural hurdle. It is no coincident that the Dow Jones passed 23,000 for the first time this week. The plutocrats are drooling in anticipation of yet another reduction in their tax liabilities. The richest 10% now own over 80% of stock market wealth according to a recent NYU study. Under the Trump plan taxpayers at the top of income distribution could see their incomes rise by almost 6%. Trump personally stands to gain by another provision that reduces the tax rate on pass-through businesses like Trump resorts to 25%*. *Here is one commentator's assessment of Trump's obvious lack of empathy with others not in his elevated socioeconomic strata: "Any normal human being with an average endowment of empathy would be able to do it [make a telephone call of condolence]. But Trump is an extreme sociopath, [emphasis added] who has to be instructed on not sounding like a sociopath. And he failed because even given the words to say, as Kelly now testifies he did, Trump managed to twist them into something callous and come off as grossly insensitive and insulting." That assessment fits US Person's definition of a "Looser". The loosers in the capitalist system are certainly workers from an economic standpoint because the system is rigged in favor of the rentiers (the result of economic financialization). That is why Marx observed, “freedom… can only consist in socialized man, the associated producers rationally regulating their interchange with Nature, bringing it under their common control, instead of being ruled by it [the system] as by the blind force of Nature, and achieving this with the least expenditure of energy and under conditions most favorable to, and worthy of, their human nature.” You can always find the straight answer at PNG!